Kingdom Animalia- This kingdom includes every animal. All animals in this kingdom are heterotrophs. Their cells don't have a cell wall seperateing them from plant cells. Phylum Chordata- All members of the Phylum Chordata have a segmented body. Have three germ layers. They all have a complete digestive system and have bilateral symmetry. Sub Phylum Vertebrata- All members have a bony endoskeleton and well developed body cavity. All have visceral systems. Class Mammalia- This class includes 500 species and only contains mammals. All members of this class have hair at some point in their life. Order Artiodactyla- This order contains the most diverse,large and terrestrial mammals alive. They are globally distributed and live in large groups. Family Giraddidae- This family only includes two living species. Most animals in this family live in central Africa. They weigh from 250 kg to 1500 kg. 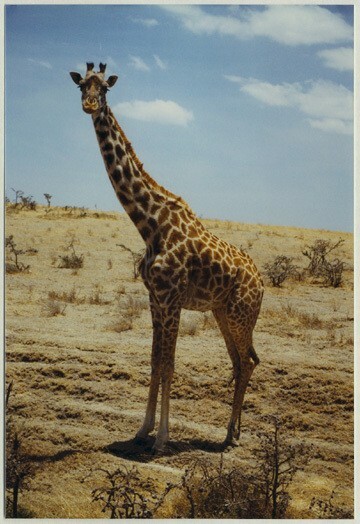 Genus Giraffa- All have long and sturdy legs,front legs longer then back legs.Necks contain 7 elongated vertebrae. Their tails measure from about 76-101 cm in length. 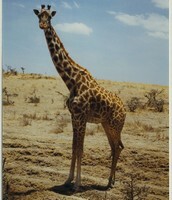 Species Giraffa Camelopardalis- Native to Africa and and worlds tallest mammal. Found in Savannas, grasslands and open woodlands. Natural Range- Native to Africa. Usually found south of the Sahara to eastern transvaal. Habitat- Found in Savannas, grasslands and open woodlands. The Giraffe has a long neck this helps it reach things up high. They have two eyes set on the top of their head they are used as a watchtower to look out for predators. They have a spotted coat used as a camouflage the colors are yellow to black. The giraffes legs are longer then its neck this helps it run faster Also it is the worlds tallest animal so it always has a height advantage on its prey. Male giraffes visit female giraffe tribes for matting this helps them reproduce. 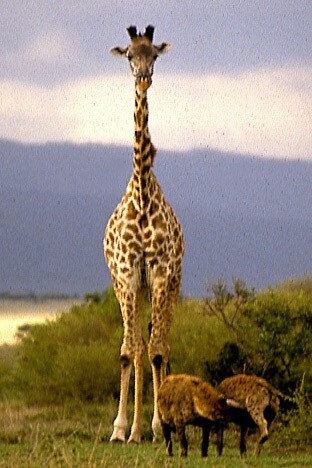 The giraffe spars members of its tribe for better dominance. 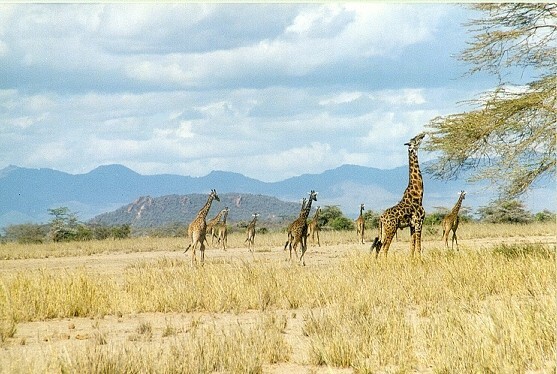 The giraffe lives in large groups so they could help each other. 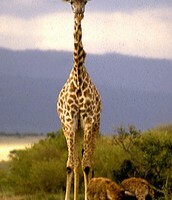 Giraffes live in grasslands so they have easy access to grass and other plants. Burton, M., & Burton, R. (2002). GIRAFFE. In International wildlife encyclopedia v.1 (AAR-BAR) (3rd ed., Vol. 7, pp. 975-977). New York, NY: Marshall Cavendish.